Jypyä Pop (Turku, Finland) on 18 July 2018 in Animal & Insect and Portfolio. That schnauzer is pretty young and always wants to play when we meet. Leevi wants to guess that the game did not turn too fast. Hooo oui rencontre pas simple pour Leevi ! Hi, Jypya, it is not Tuesday today ! Don't make me laugh too much !! @Hiro: Joyful things can not laugh too much, laughter is a good exercise for the ball. Have fun that this made You happy. oh , he tightened the leg : it's a friend !! Superb capture of the scene . Le chat n'a pas l'air très rassuré. @Martine: The cat is a bit nervous because the young dog is unattractive. Leevi looks to take the defensive stance as Leevi is backed up against the foliage. Hopefully their next encounter will be friendlier as they recognize each other and mean no harm. @Steven: That dog is very friendly and young. It's a little bit too eager for Leevi to give it sometime some instructions. The tail is up so he is happy to see Leevi. Leevi looks a little unsure. I hope all was well and he made a friend. Love Leevi's paw...ready to strike. Great action shot. Leevi is ready to smack that boy if he gets too rambunctious. Leevi looks very cautious but not afraid. They both seem on guard. 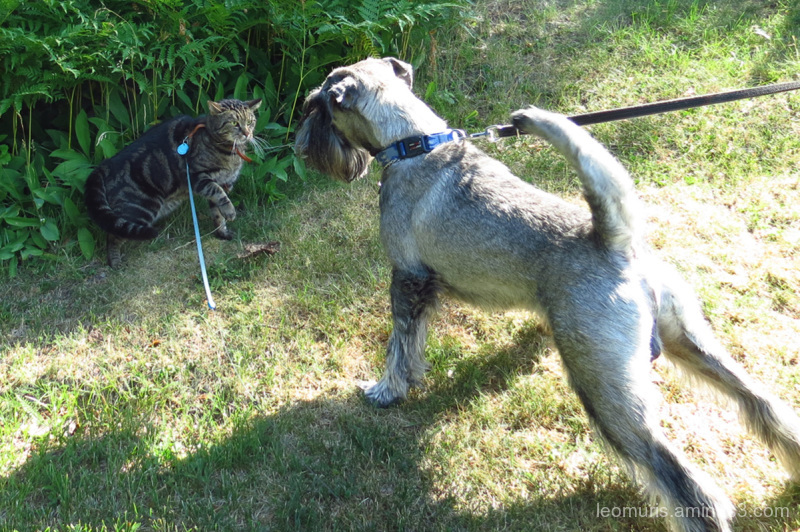 @B. Thomas: A bit of excitement is that the dog is keen to play and Leevi wants to divide the boundaries. Walk with Leevi is an adenture every day.